This song would doubtless have been forever lost, had not Marie Antoi�nette fancied it upon hearing it sung to her baby by its nurse. She, herself, adopted it, and it became famous, and was soon sung in every cafe and carrefour in Paris; presently, in all France. It was sung on the stage, it was introduced into the " Marriage of Figaro." 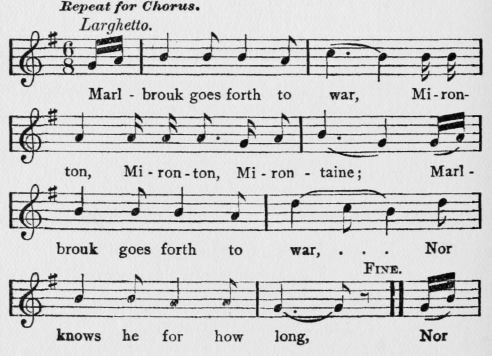 Beethoven used the theme in 1813. We are familiar with this sung as " We won't go Home till Morning," and " He's a Jolly Good Fellow," � remarkable transgressions from the original spirit. The original is not all given here. It is com�pleted by a crude, soldier-sort of description of the funeral, and is a strange mixture of pathos and humor. The song was doubtless some hundreds of years old when Marie Antoinette's baby first fell asleep to its singing by Madame Poitrine, the child's n«rse. Napoleon hummed it when he started on his way to Russia on the fright�ful campaign of 1S12. He sang it at St. Helena. An interesting English version is appended.